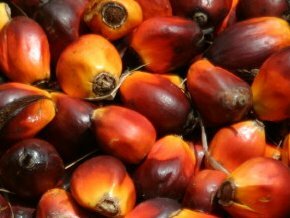 These steps will show you how to extract the rich palm fruit concentrate from palm fruits. 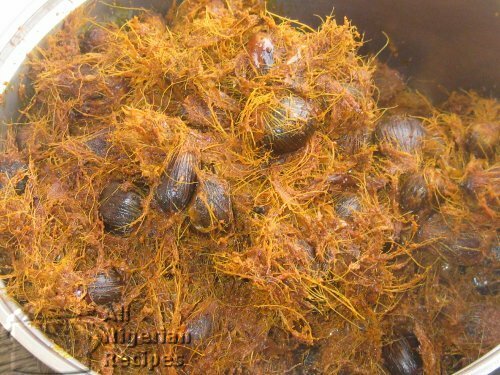 The extract is used to cook Banga Soup/Stew, Bitterleaf Soup and Ora/Oha Soup to name a few. Wash the palm fruits very well and place in a sizeable pot. Pour enough water to cover them and start cooking at medium to high heat. Cook till the palm fruits are well done. A good sign that the palm fruits are well done is that you can easily rub off the flesh from the nuts. The palm fruit is also soft to the bite and depending on how fleshy the palm fruits are, you may notice cracks on the flesh of the fruits. While they are still hot, pound the palm fruits in a mortar with a pestle till all the flesh are separated from the nuts forming a smooth pulp as shown in the photo. Pounding when the fruits are still hot makes it easier for the flesh to separate from the nuts. Sort the nuts from the pulp and set these aside. This separation makes the extraction process more efficient because the nuts will not get in the way when you are washing the pulp. Wash the nuts in a small amount of warm water. Then wash a small quantity of the pulp in the same water, wringe and set aside. Wash another batch of pulp till the water becomes concentrated. Sieve the conc. banga extract into another bowl. Pour fresh warm water into the washing bowl, rinse the earlier washed pulp then continue with new pulp. Repeat the process till all palm fruit pulp has been washed. Leave the extracted palm fruit concentrate to stand for some time then slowly pour this (decant) into the pot that will be used to cook the Banga Soup / Stew, taking care not to pour the tiny pieces of fibre that have settled at the bottom. 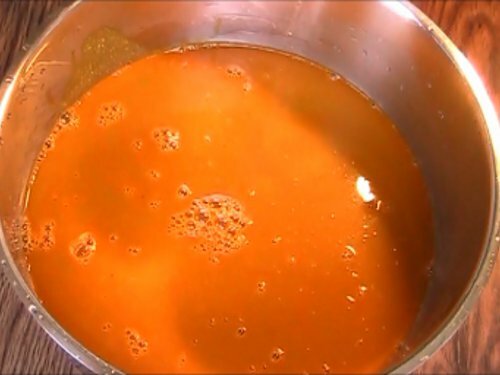 Water should be used sparingly during the extraction process so that at the end, the extracted liquid will have the consistency of evaporated milk or conc. juice bearing in mind that you still have to add the beef stock. The extract is used to cook Banga Soup/Stew, Bitterleaf Soup and Ora/Oha Soup.